Splints are rarely required for treatment of the elbow. They should always be used under the supervision of a qualified elbow practitioner. To be worn ……………………………. 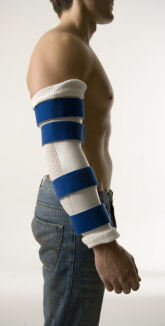 Ensure that the splint conforms to the crease at your elbow so that it is in the correct position. You will find it more comfortable to wear stockinette underneath and fold it over the top and bottom of splint (as shown above). The straps must be firm to hold the elbow into the splint, but not so tight that they are uncomfortable. If you are unable to tolerate wearing the splint overnight, despite having adequate pain relief, please discuss this with your therapist at your next appointment. To be worn 5 times a day for 5-10 minutes at a time. The Velcro straps need to hold the two sections of the splint firmly in place. Ensure that these straps are positioned so that they do not restrict elbow flexion. Pull the elastic strap around both sections to flex your elbow as tightly as you can tolerate. After a few minutes, as your elbow relaxes, try to increase elbow flexion by tightening the elastic strap. To increase elbow flexion, press your forearm against a wall as you fit the splint (see picture below). DO NOT drive whilst wearing the splint as your insurance would be invalid. DO NOT operate machinery whilst wearing your splints. DO NOT alter the splints in any way. DO NOT leave the splints where they will get too hot as they may melt (i.e. sun, radiator, hot water). The splint and straps may be washed in Lukewarm soapy water. If there is any redness, swelling, numbness, pins and needles, discomfort or increased pain, remove the splint immediately and contact the department. If this occurs out of office hours contact your GP immediately or attend your local Accident and Emergency Department.